1) In which movie series do characters often 'beam' from their spaceship down to the surface of planets? 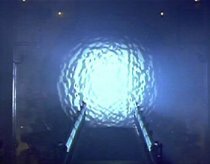 2) In what movie was this a gateway that teleported people to another planet? 3) What did the scientists of "Tron" use as a test object in their teleportation experiment? 4) What ended up happening to the animal that is first teleported up from the surface in "Galaxy Quest"? 5) In which movie did a human teleport to an alien home world at the end of the movie and trigger the destruction of their planet? 6) What sport did we briefly see a teleporting kid playing in the 2000 flick "X-Men"? 7) What did the characters of the Jet Li flick "The One" use to pseudo-teleport between alternate universes? 8) In which John Carpenter movie did we see an alien teleport off into space? 9) Which Star Trek crew member traditionally operated the transporter? 10) In which movie is a crippled marine teleported from a spaceship to a planet named Pandora? 11) In this movie aliens use their wrist watches to teleport underground. 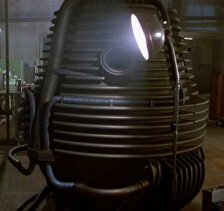 12) In which movie was this used as a teleportation device?